Pearl Rotarians heard expansive long-term plans March 26 for the redevelopment of our neighborhood. We call this area the edge of the Pearl District. The city government calls our area the Broadway Corridor and the plans to redevelop 34 acres around us. June Reyes from Prosper Portland, the city government sponsoring agent, told Rotarians that most of the work on the project to date has involved planning and organizational activities. Hopefully, in the next year or so, a major rebuilding of the corridor with begin, although some more cautious thoughts are suggested below. Handouts from the city say that the renewal project may last as long as 15 to 20 years. June reports that the key focus of redevelopment in the near future will be the large U.S. Postal mail sorting station that is located across the street from our Ecotrust building. The post office building will be torn down, the sorting facilities moved elsewhere, and a large park-like community for multiple uses will be constructed. The city owns the land in the district, but will depend on private interests for some of the necessary money. June showed Rotarians slide images that suggest some of the possible future development ideas. Portland’s historic Union Station will remain, being integrated more into the current postal land. June presented some maps that highlighted three possible themes in the renewal area: play, nature, discovery. Especially notable in the new area will be green spaces and walking/hiking paths. In addition, the developers clearly intend the district to be seen as a fun destination for visitors, involving sports facilities and recreational opportunities. The planners have envisioned ambitious specific goals for the area. Eventually, June told Rotarians, residential development will include 2,000 households of which 700 will be affordable housing, and job sites for 4,000 workers. While the Corridor is intended for all folks, the literature on its future development especially emphasizes its value for three groups: people of color, the low-income population, and children. The material on the Prosper Portland website gives some rationale for this by stating “Previous downtown development projects have propelled Portland’s economic growth and contributed to Portland’s reputation as a popular destination city. However, many downtown projects have failed to benefit - or have negatively impacted - longtime residents and community members, particularly low-income residents and communities of color.” Consistent with these ideas, some of the project literature emphasizes the necessary development of shops and facilities that are especially desired by low-income residents. Pearl Rotarians spent a lovely evening last monday sipping and nibbling while prepping dictionaries which will be given to area 3rd graders. A statistic taken from Portland's Chilren's Book Bank states, "In low-income neighborhoods, the ratio of books to children is one book for every 300 children. Middle-income neighborhoods average 13 age-appropriate books per child." Mark your calendars! We have been invited by the Portland New Generations Rotary Club to partner with them in hosting a fun and important golf tournament. The mission is to raise awareness and resources to alleviate homelessness in Portland. The event will be held at Persimmon Country Club’s private golf course on Monday, Aug. 28, with lunch followed by a 1 p/m/ shotgun start. The Portland New Generations and Portland Pearl Rotary clubs have combined to serve the City of Portland for more than 47 years. Together we have donated thousands of dollars and volunteered countless hours to our community. One of PPRC’s visioning goals is to collaborate more with other Rotary Clubs. Both clubs share a vision of making a difference in the homeless community and we support many of the same non-profits. What a great opportunity to work together! 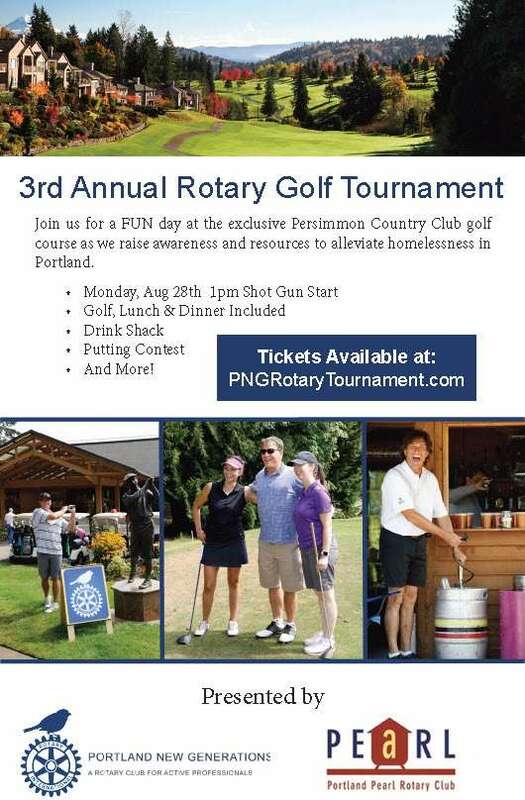 Portland Pearl Rotary hosted its own golf tournament for a couple of years, with modest success. New Generations has hosted this tournament at Persimmon CC for the past two years and it has grown in stature each year. By combining our effort and resources, the goal is to produce an event that has a much greater impact than we were able to produce on our own. This is where we need your help! PPRC members are tasked with recruiting foursomes to play in the tournament. The cost is $500 per foursome or $125 per player. This includes 18 holes of golf, lunch, dinner, drinks and prizes. The more players that we recruit, the more money we can raise in support of homelessness. We have set a goal for PPRC to bring at least 10 teams to the event. We need your help to accomplish this. If you play or if someone you know or work with plays, invite them to join us. This can be an excellent opportunity to team-build with your colleagues, enjoy a fun day with clients, or a chance to get away from work for a while. Our goal is to fill all of the sponsorship slots. It will be a great opportunity for you or your company to gain great exposure while also supporting a very worthy cause. We will also be looking for 5-6 day of the event volunteers to help out. Registration is available at: http://pearlrotary.tofinoauctions.com/golf2017. For more information about the tournament, please contact your PPRC golf committee members, Jack Bradley, Tara Mussulman or Pat Mahoney. We look forward to having you join us for a fun and rewarding day on the links! On a rainy Earth Day morning, 25 Rotarians and friends gathered at Columbia Park in North Portland to prepare for a day in the mud--the spring Dig-In with our community partner Growing Gardens. Rotarians gathered with several other teams from around Portland to socialize, enjoy donuts and learn how to build a good garden bed. Team Rake Superior (Don and Jo Barney, Matt, Fiona and Leo Lillard, Pat and Deanne Mahoney, Jack Bradley, Diane Brandsma and Perry Swanson) traveled to the home of Heather Rivas and family to build two garden beds in their backyard. Growing Gardens volunteer and team leader Jessica Gutsgell provided clear and simple instructions that the Rake Superior team executed remarkably well. Heather Rivas and her family were active participants in building the gardens. With cooperation from the weather, plenty of laughs and some real honest work, the Rivas family gardens were constructed of the highest quality, on schedule and within budget. The Pearl Onions (Katja Gluhr, son Emmerich and husband Emory, Alanna Miel, Adam Creighton, Janet Young, Jim and Heather Bowman, Nancy Fowler, Casey Hazlett and Seth D.) traveled to Northeast Portland to build two garden beds in the home of a young family. The mother, Gabriela, pitched in to help build garden beds, with her two daughters, Addy and Lucinda. Under the direction of the Growing Gardens volunteer team leader, Adam, the Pearl Onions quickly got to work, dividing into two teams to dig two garden beds. The teams raced to complete construction, and despite so many hands and tools working in a small space, no injuries were sustained. The team uncovered lots of worms, to the delight of Addy and Lucinda. Gabriela shared her delight over the garden beds, saying that she had wanted to start gardening for a long time, and was excited by the support she was receiving. The new raised garden beds came together quickly, and the teams returned to Columbia Park for a pizza party, happy in their labors. Each of the Portland Rotary teams also raised $1,000 for Growing Gardens as part of their participation in the Spring Dig-In. Promote home-scale organic food gardening to improve nutrition, health and self-reliance while enhancing the quality of life and the environment for individuals and communities in Portland, Oregon. Pearl Rotarians are used to building bonds, two members together (delivering Meals on Wheels), in small teams (feeding men in transition at Bud Clark Commons), in groups raising funds for good causes in the community and in social get-togethers. But this was a new chapter in camaraderie: bending their backs and getting their hands dirty, together learning new tricks of an age-old occupation, and joining in the joy of preparing for a literal harvest of good food and good will. Portland Pearl Rotary makes a difference in the lives of waste-pickers in Pune, India. Portland Pearl Rotary makes a difference in the lives of young girls completing their education in the Democratic Republic of Congo. 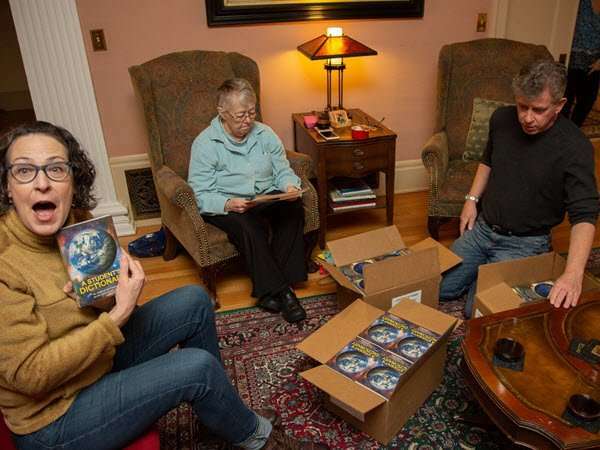 Portland Pearl Rotary makes in a difference in lives of Portlanders by delivering and serving food through Meals on Wheels and Transition Projects. 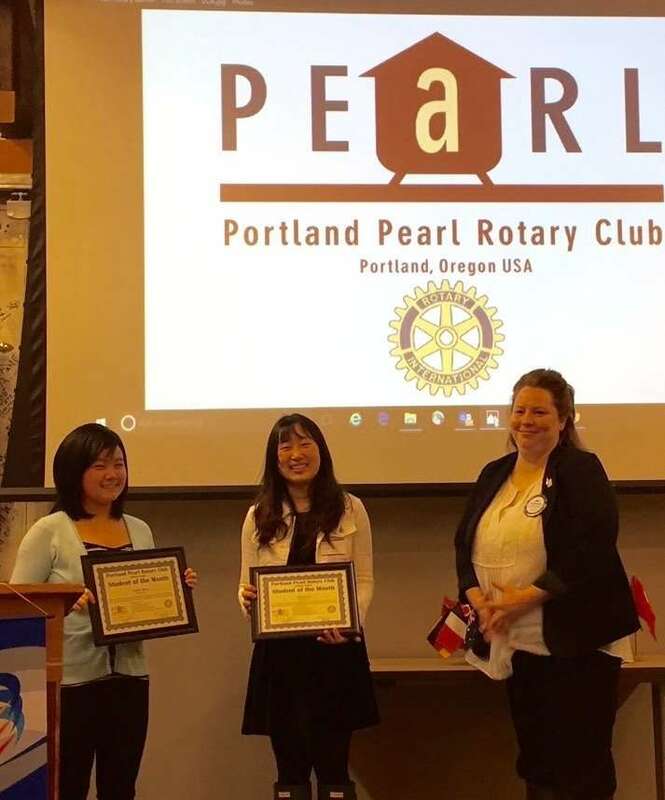 Portland Pearl Rotary makes a difference by offering educational scholarships and awards of merit to students. 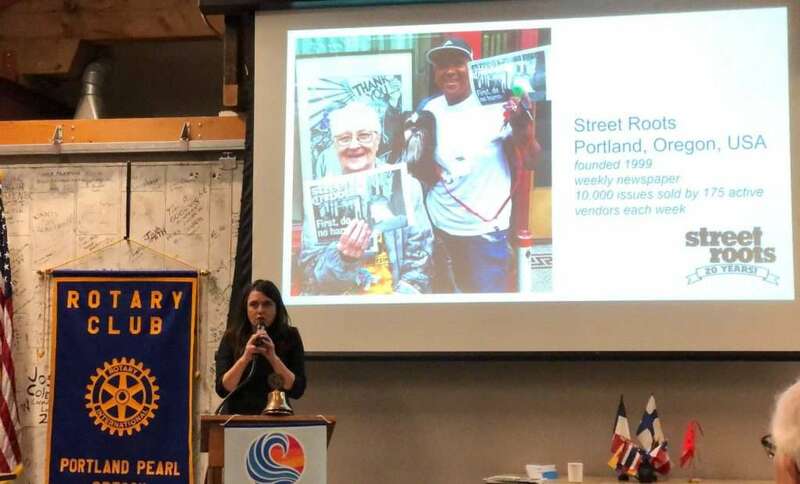 Portland Pearl Rotary makes a difference by establishing one of the only Social Justice committees in District 5100. Portland Pearl Rotarians make a difference by fostering supportive, healthy, dynamic relationships with fellow members and our community. Portland Pearl Rotary makes a difference by growing leaders. I want to make a difference by showing up for our club and to you as my fellow friends and family in service and peacemaking. I want to make a difference by celebrating who we are, what we do and why we do it. I know we’ll make a difference in the coming year because with all of us together, nothing can stand in our way. Our future is bright. New community partnerships for Pearl Rotary will swing into action in April with at least 30 club members signed up for volunteer activities on two scheduled local projects. The club’s Community Service Committee is developing the new partnerships to provide volunteer opportunities for PPRC members to give back with service to the community and to recommend effective uses of funds available in the Pearl Fund for charitable purposes. First up on Tuesday, April 4, is New Avenues for Youth’s Scoop-a-thon, a fundraiser for the core area non-profit. Teams of community volunteers will spread throughout town to scoop ice cream at Ben & Jerry’s outlets to raise awareness and funds for New Avenues’ job training programs. New Avenues for Youth was established in 1997 by local business and community leaders in response to the growing needs of homeless and at-risk youth in Portland. Its mission is to work in partnership with the community to prevent youth homelessness and provide homeless and at-risk young people with the resources and skills needed to lead healthy, productive lives. Pearl Rotarians Chris Krenk and Michael Steen, liaisons to New Avenues, report at least nine club volunteers are signed up for the event. A team from that group will work the noon to 1 pm shift at the Ben & Jerry's shop at Portland State University, 510 S.W. Mill St, in Portland. Plans call for a possible second shift of Pearl Rotarians to scoop during a later slot at the Ben & Jerry's 524 SW Yamhill. Club members signed on for the Scoop-a-thon include: Chris Krenk, Michael Steen, Don Barney, Casey Hazlett, Elizabeth Cramer, Kristina Belasova, Pali Perez-Roja, Kelly Morrow and Rich Barker. As its participation in the fundraising effort, Pearl Rotary will present a $1,000 sponsorship check to Sean Suib, executive director of New Avenues for Youth, when he speaks to the club on April 11. PPRC’s liaisons to this new community partner—Heather Bowman and Casey Hazlett—outline the role for club volunteers signed up to participate in Growing Gardens’ annual Dig-In event on Earth Day, Saturday, April 22. The Dig-In marks the kickoff for Growing Gardens’ seasonal activities. Growing Gardens promotes home-scale organic food gardening to improve nutrition, health and self-reliance while enhancing the quality of life and the environment for individuals and communities in Oregon. The non-profit organization helps communities through three projects: (1) Its Youth Grow After-School Garden Clubs to develop the next generation of Portland gardeners (2) Its Lettuce Grow program works with thirteen adult correctional facilities and four youth correctional facilities around Oregon, providing horticultural education and gardening opportunities to inmates. (3) Its Home Gardens project supports fresh food access by helping low-income families grow food for themselves. For the next three years, Growing Gardens staff will provide education, support, materials (seed, seedlings, tools, fertilizer, etc. ), and coaching to help the family successfully grow its own fresh food. This year, Portland Pearl Rotary has formed two teams among some 12 in the community to build garden beds for Home Gardens’ Spring Dig-In. 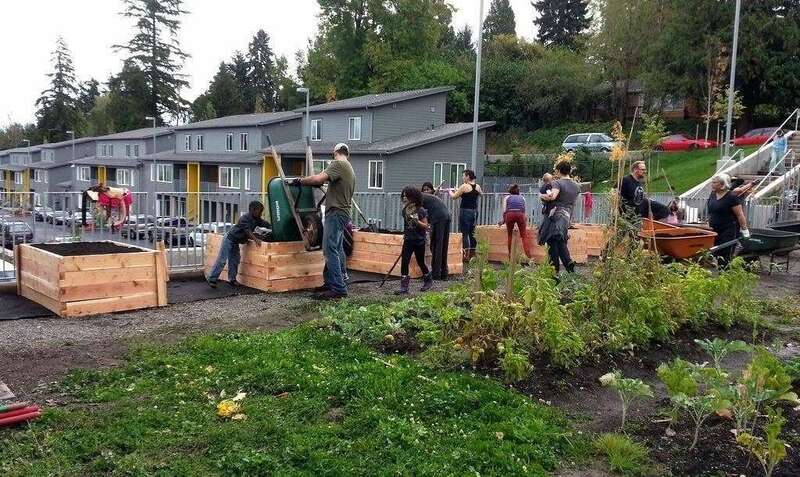 On April 22 from 10 a.m to 1 p.m., the PPRC teams will construct garden beds in the yards of two families in North Portland. The teams will then be treated to pizza and drinks by Growing Gardens when they finish their work. Team Members: Pat Mahoney, Deanne Mahoney, Perry Swanson, Jack Bradley, Michelle Bradley. Matthew Lillard (with Dean, Fiona and Leo), Lora Lillard, Don Barney. Jo Barney, Diane Brandsma. Team Members: Heather Bowman, Jim Bowman, Casey Hazlett, Blake Evenhus, Seth Gardner, Janet Young, Katja Gluhr (and Emmerich & Emery), Mary Lange, Alanna Miel, Adam Creighton. The multi-year co-presidents of Lincoln High School Rotaract Club--Jennifer Song (left) and Joanne Lee--were honored 2/21 as PPRC's students of the month. They are pictured, with their plaques, with our club's youth service director (and president-elect Tara Mussulman). 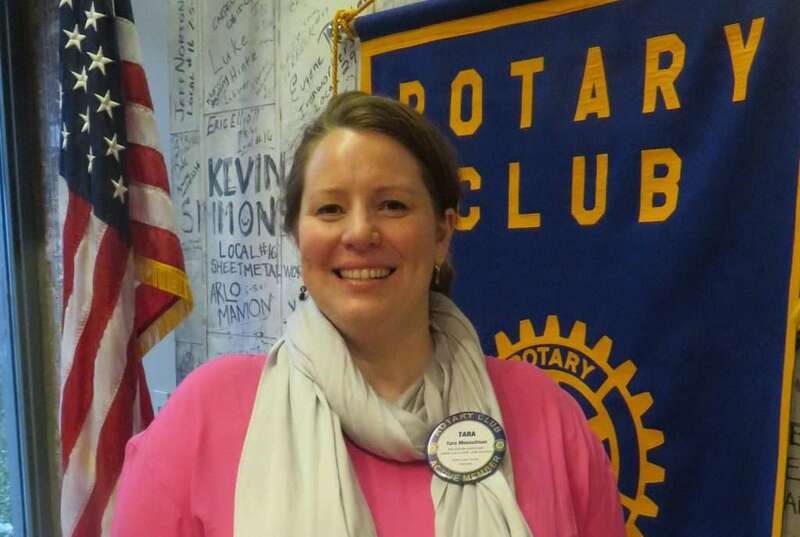 Summarized Tara in an email to the LHS seniors: "On behalf of myself and speaking for the Portland Pearl Rotary Club, I want to extend a thank you to both of you for your excellent and engaging presentations, your leadership in LHS and in the community and clearly the torches you both carry. We are always impressed with the LHS students we have the good fortune to recognize them for their accomplishments; and each of you met and exceeded our hopes in extending our award to deserving students. Congratulations on your achievements and best on future successes."